Bushsports Australia is a leading group activities, adventure experiences provider based in Sydney and Gold Coast. Facilitating exceptional outdoor team building activities since 1972. Proud pioneers with an adventure heritage. Looking for exciting adventure activities for your group to enjoy? We package adventures and learning experiences for all groups and corporate businesses Australia wide. Focusing on custom built outdoor team building adventure packages for schools, students, athletes, corporate groups and companies of 5 to 500 employees. From Sydney to the top of Australia in Tropical North Queensland near Cairns to the beaches on the Gold Coast, Surfers Paradise and Brisbane. Heading South into NSW throughout Sydney CBD, The Rocks, Blue Mountains Adventures. Hunter Valley Wine Country, Southern Highlands Escapes and throughout Canberra. Including thrilling adrenaline outdoor activities on The Gold Coast and Surfers Paradise. Guiding over 100,000+ participants safely on a wide range of adventures. Bushsports has the experience and capacity to deliver amazing custom built and tailored outdoor events for your team. For corporate groups. Our focus is on providing excellent quality adventures with an improvement in teamwork and personal leadership skills. Backed with experiential learning experience and training exercises that achieve positive results. – Abseiling, Canyoning, Canoeing, White Water Paddling, Segways, Archery, Bubble Soccer, Archery Tag. Wine Country Escapes, direct from The Crowne Plaza, Tuscany, Mercure Hunter Valley Resort, Cypress Lakes, Hunter Homestead, Eagleview and Sebel Kirkton Park. in Kangaroo Valley, Berrima and Bowral from Gibraltar Hotel, Peppers Manor House and Craigieburn Hotels. Bubble Soccer Rage Craze, Amazing Terrigal Races, Skillion Treasure Hunts, Mountain Biking, Tree Tops Adventure Ropes Courses. Mining Community & Training Activities from Northern Territory NT to Western Australia WA and South Australia SA. 1. Adventure Activities and Experiences. 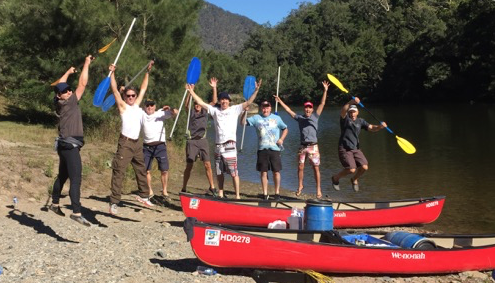 Adventure activities in Sydney, Blue Mountains, Hunter Valley, Central Coast & Southern Highlands. From Abseiling to White Water packages available. 2. Corporate Adventure Team Building Activities, Team Development Exercises, Management Training and Leadership Programs. Professionally developed and facilitated programs by qualified, experienced, trained instructors, guides, coordinators, hosts & facilitators. Ready to create your next adventurous conference package. 3. Large Corporate Group Adventure Activities, Outdoor Education Programs, Games and Special Events. Professional education experiential learning programs by qualified, experienced, trained instructors, guides, coordinators, hosts & facilitators. We aim at setting you in the right direction for Adventure Experiences in and around Sydney the Blue Mountains, Hunter Valley, Southern Highlands, Melbourne & Brisbane. New Team Building ideas for corporate groups requiring professional team building service. Our quotes team will meet and discuss your requirements and design a brilliant solution. Team Development Activities – excellent quality facilitated programs in Sydney, The Botanic Gardens, UNSW, Sydney University. The best things to do in Sydney Olympic Park and Centennial Park, reaching out The Blue Mountains, Hunter Valley, Central Coast, Gold Coast and Southern Highlands. Teamwork Exercises consistently improving communication, cooperation and teamwork skill. As well as further enhancing team camaraderie and interpersonal relationships. Team Building Games are fun for businesses looking to get to know each other better. Ice breakers, motivators, energisers. More fun games than you can poke a stick at or Hula Hoop! Ideas fresh and dynamic ideas to effectively develop your corporate group in a fresh unique way. Quotes enquire now and receive a quote within one business day. Fast & easy. Adventures in Sydney Our activities and team events are held all across Sydney, Bondi, Manly and Northern Beaches. Also in Coogee, The Rocks, Circular Quay, Parramatta, Sydney Olympic Park. For inner city businesses we offer urban adventures in Sydney CBD and surrounding Surry Hills, Darlinghurst, Rose Bay or Centennial Park. Bushsports partners in Sydney is THRILL team events. Providing fun games, team development & exciting corporate team building activities. Ready to take your teams, managers, employees and staff on an adventure journey to improve staff morale, motivation, communication, collaboration, problem solving and team performance. Enquire with us for fun Team Bonding Experiences. What have we accomplished? The best Amazing Races since 2003. Art Creativity, Beach Activities, Adventures & Outdoor Training, Creative Team Building, Treasure Hunts, Mission Possible, Survivor Events, mini Olympics, Build a Bike for Charity Team Building and Corporate Social Responsibility. Cocktail Making, Master Chef, Cooking Team Building. Orienteering, Bike Riding, Trivia, Corporate Entertainment, Raft Building, Minute 2 Win It Games. Casino Nights, Movie Making, Segways, Big Bike Cycle Kart. Team Activation Conferences, Italian Jobs, Lego Serious Team Play, Sculpting, Trap A Rat, Billy Kart and Go Kart making, Corporate Experiences, Obstacle Courses, Navigation Courses. Blokes Team Building, Ladies Only training, Fun n Games, TMS, DISC, Myers Briggs and custom designed events for 10-1,000 participants. Team up with Team Building Activities by THRILL ensures the wow factor for your next next offsite. Designed to improve communication, teamwork, collaboration, negotiation, strategy development, leadership, team leadership, project management, time management and problem solving. We engage groups with fun Conference Breaks, Energisers, Off Sites and Planning Days Australia Wide. THRILL facilitates companies throughout Australia and New Zealand. Increasing team spirit, team performance and team effectiveness with interactive team bonding. Link to www.thrill.com.au for wow factor experiences or contact the professional THRILL team building activities and events team in Sydney, Australian Head Office on 02 9630 2222.